As usual with practically all my builds, I like to give models my own personal touch. The Falke is definately no exemption here. I have heavily modified the original kit with kit-bashed and minor scratch built parts. Lots of sawing and reconfiguration to bring it to it’s present state. Hope you guys like the results. Some nice touches here, Charles. You’ve certainly got the ‘lived-in’ look with the metals. 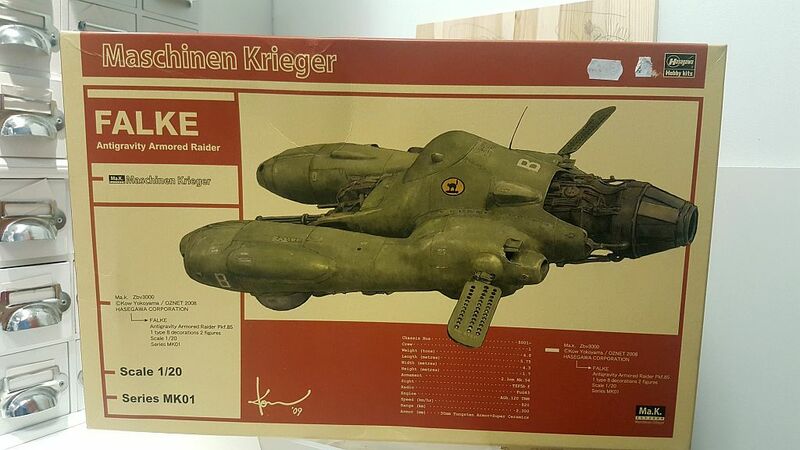 Also have been looking at this Hasagawa Krieger series in relation to a new project, but not a straight build. Will be interesting to see your take on it Rob. Looks great and very interesting! Thank you. Now, I just need an air brush. Not being a Sci-Fi guy, I have no clue what it is, but it does look well built, painted and weathered! Then, that is good enough for me. Thanks. Cool looking model. Nice one. Very cool model. It looks like it could be used as a prop in some sci-fi movie, it oozes quality. Do you mean it was brush painted? Even more amazing. Hi. Thanks. I used spray paints and sponge painting as well as brushes. Then in certain areas I took a dry paper towel and rubbed of the paint to get the faded drag effect. I’m not sure what it is but it would look good on my drive! Great work. Looks like a space rat rod!